ITN: In a span of 30 years, there have been almost 700 known investment treaty arbitration cases. A total of 107 states—including many developing countries—have faced claims based on investment treaties, and many of them have been ordered by arbitrators to pay enormous sums in compensation to foreign investors. 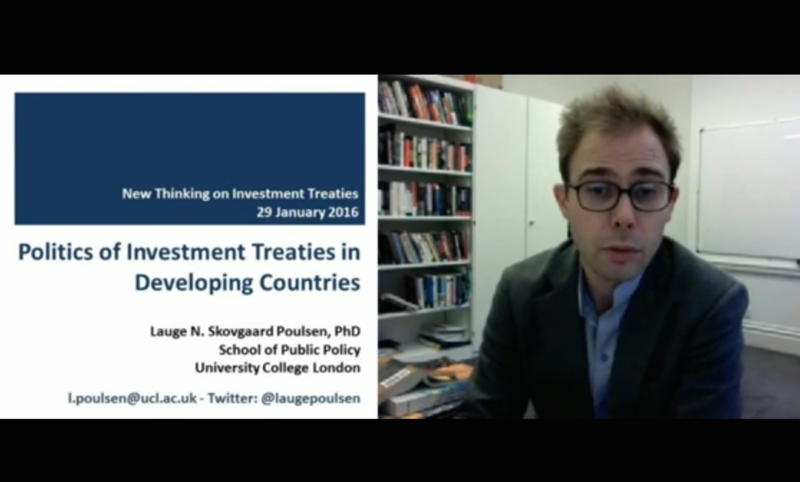 Why did developing countries enter into treaties carrying such great risks? Was there a problem in the cost-benefit analyses they conducted before entering into these treaties, or was this analysis simply missing? LP: With 3,000 treaties signed over almost 60 years by almost 200 countries, it is obviously impossible to provide a single explanation for why every single treaty has been adopted. Some were signed for purely political reasons—for instance, to establish closer diplomatic links with the other party. Some were signed to show that a government adhered to the Washington Consensus and an international rule of law. Some were signed to promote domestic reforms. A few may have been signed to de-politicize investment disputes. And so on. That said, by far the most important expected benefit was that bilateral investment treaties (BITs) would be crucial to help attract foreign direct investment (FDI). Once large numbers of developing countries opened up to foreign investment during the 1980s and 1990s, many joined the investment treaty regime in the expectation that the treaties were very important instruments for foreign investors deciding where and how much to invest abroad. The risks of the treaties were often entirely ignored. As there had been very few investment treaty claims during the 1980s and 1990s, the assumption was that the treaties would hardly ever be instrumental for resolving disputes in practice. A failure to appreciate the potency of investment treaty arbitration was not unique to developing countries, of course, as few could have imagined what was yet to come. But while officials in Western states and international organizations may have underestimated the scope of the protections before arbitrators “filled in the blanks” of vague agreements, officials in many developing countries saw the treaties as little more than diplomatic tokens of goodwill, which would be important signals for foreign investors but entailed no real liabilities or legal significance. This meant it was typically not until developing countries became subject to claims themselves that they began to realize what they had signed up to over decades. There were exceptions, as some developing country governments were very well equipped to negotiate the treaties. But by and large, the popularity of BITs in large parts of the developing world was due to a failure to appreciate their bite. How can we understand this? Why would so many governments sign up to some of the most potent instruments in international economic law without even caring to check what the treaties meant? In my book, I argue that decision-making theories from behavioural psychology and economics go a long way to explain this puzzle. From this perspective, developing country officials and politicians cannot be assumed to be highly sophisticated utility maximizers engaging in sophisticated cost-benefit analyses. Rather, they are bounded rational—just like the rest of us. When appreciating just how little effort that typically went into analyzing the costs and benefits of the treaties, we can understand both the inflated expectations about the treaties’ economic benefits and the failure to appreciate their risks. ITN: How can developing country governments assess the risks and potential benefits of entering into an investment treaty including an investor–state arbitration provision? What factors should they take into account and what risk mitigation measures should they take? LP: A place to start could be the informal analytical framework that I developed together with Jason Yackee and Jonathan Bonnitcha for the British government. It is freely available online[*] and can be applied to other cases as well, including developing countries. Here we structure the analytical task into a series of questions and sub-questions focusing on economic and political costs and benefits. We also provide suggestions for indicators and other sources of information to guide governments. Provided a reasonable case can be made that the treaty will provide economic or political benefits, one of the practical concerns arising from my book is whether the country has sufficient capacity to comply with and internalize the various provisions of the treaty at different levels of government. If they do not, the risk of claims loom large. Moreover, with scarce bureaucratic resources and political capital a developing country government has to consider whether signing, ratifying, implementing, and internalizing an investment treaty really provides what Danni Rodrik in another context has called the biggest bang for the reform buck. If not, then scarce attention and resources could be better spend elsewhere. ITN: Based on your research, do you notice any trends in respect of cost-benefit analyses before entering into investment treaties? In particular, are developing countries more aware of the potential benefits and risks of those treaties? If so, in practice, has awareness led to better, more rational decisions in negotiations? LP: The rise of investment treaty arbitration has significantly changed the patterns of adoption among developing countries. Combined with the efforts of organizations such as UNCTAD and IISD, the claims have often—though not always—resulted in a somewhat more careful set of negotiations. Some governments have also taken steps to towards better implementation and internalization, although this is still very rare. By and large, however, the changes have been largely incremental. Rather than fundamentally re-thinking the content of investment treaties—for instance by including strong investor obligations or relying on inter-state dispute settlement—the basic model has remained intact in the vast majority of cases. I include reflections on this in the book, as it fits very well with a bounded rationality framework where governments value the status quo and “default rules” much more than we would expect in traditional rational choice frameworks. ITN: How does the cost-benefit analysis change in the context of a regional trade agreement—in which many types of economic policies are bundled together—versus a bilateral investment treaty? For instance, several developing countries are among the initial signatories of the Trans-Pacific Partnership (TPP), and others have expressed their interest in joining the agreement. How would you analyze this interest on the part of developing countries? LP: The standard answer from political scientists would be that an expansion of the coverage of agreements allows for issue linkages to facilitate compromises through a give and take. This is undoubtedly important, but I would suggest two other factors could be equally, if not more, important for this latest wave of investment treaties. First, there appears to be an expectation among many governments that comprehensive trade and investment agreements will have a much greater impact on FDI than stand-alone BITs. Second, a number of governments seem convinced that more careful and detailed treaty language in the style of the investment chapter of the North American Free Trade Agreement (NAFTA) will provide them much greater policy space than traditional European-style BITs. Although I have not studied these recent negotiations in any detail, they do raise the question whether the expectations of developing country parties are now rooted in careful cost-benefit analyses. For instance, there is some preliminary evidence on the FDI question, but one could query whether we may be witnessing a new round of inflated expectations about economic benefits flowing from investment treaty protections. Equally, and as mentioned before, future studies could also query whether sticking with the basic investment treaty models already available in the status quo may occasionally be the result of a bounded rational strategy.